Pakistan, which accounts for 80 percent of the world’s polio cases in 2014, may become the last country where the polio virus remains endemic and widespread, according to Human Rights Watch. But the number of polio cases standing at a 15-year high of 265 is not for a lack of resources, but rather lack of protection for health workers who are under siege by Taliban-inspired militants. This week, two separate attacks on Polio vaccination workers left three health workers dead and injured another. According to Time magazine, the militants remain suspicious of vaccination programs due to a bogus hepatitis B campaign used by US officials when they were searching for Osama bin Laden in 2011. Last month an international monitoring body blamed the Pakistani government for its lack of protection for health workers in a report, which documented police protection turning up late, if at all, and that vaccinators are rarely paid their stipends. 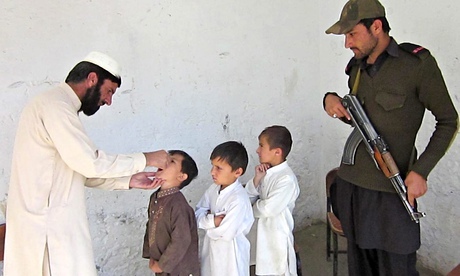 A military campaign in the North Waziristan region in June forced a large number of unvaccinated children to disperse to other parts of the countries, flaming the rise of Polio cases in other regions. The same report showed Pakistan having exported the virus to Syria, China, Israel and Egypt. After the death of health workers, along with surging numbers of Polio cases, the Pakistani government must do more to protect the vaccination system, or they risk infecting not only more Pakistanis but the rest of the world.